Since before its formal independence from direct British rule in 1867 to the present day, Canada has used the Canadian dollar as her currency. Canadian currency will be very familiar to American coin collectors: the Canadian dollar is divided into 100 cents in coin denominations of 5, 10, 25 and 50 cents, together with 1 and 2 dollar issues popularly called loonies and toonies. Canadian nickels, dimes, and quarters are so similar in shape and size to their American counterparts, in fact, that Americans and Canadians often find each others coins in circulation. 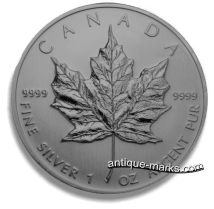 When silver investors think Canada, the first thing that comes to mind is usually the Canadian Silver Maple Leaf, a beautiful collectible .9999 fine silver bullion coin formally designated as legal tender by the Canadian government. However, the Maple Leaf coins are far from the only Canadian silver coins issued and available to collectors. From 1858 to 1968, the Royal Canadian Mint variously issued silver coins in 5, 10, 25 and 50 cent pieces. These Canadian silver coins were minted in .925 sterling (or 92.5%) fine silver up until 1919, after which the mint switched over to .800 fine silver until 1967 for the 10, 25 and 50 cent pieces. The Canadian mint then switched the 5 cent piece over to pure nickel in 1922 after a two-year stint as a .800 fine silver coin. Canada also minted large, dazzling one dollar silver coins from 1935 to 1967, all with a .800 silver purity. Canadian silver coins are an excellent choice for the silver collector or investor. .800 fine Canadian silver coins are readily available in North America, and they sometimes even sell for prices below the value of the silver. Unfortunately, it’s extremely difficult to actually find these coins in circulation in Canada. The Royal Canadian Mint hasn’t minted any silver coins, excepting commemorative issues and Maple Leafs, since 1968, but it is possible. Bear in mind that none of the current 11-sided loonie dollar coins are silver, aside from certain limited proof issues. All Canadian silver dollars minted from 1935 to 1967 are round and bear the Voyageur design on the reverse. Be wary of 1967 and 1968 Canadian 10 and 25 cent pieces. The Canadian mint briefly debased its dimes and quarters to a .500 silver purity from mid-1967 to mid-1968 before switching to a fully base metal composition. Because these changes took place in the middle of each year, there are also .800 fine 1967 dimes and quarters in existence, as well as copper-nickel 1968 dimes and quarters. It is very difficult to tell which 1967 and 1968 coins are made from which compositions without performing an acid test or a specific gravity test. Only dimes and quarters were affected by these changes, however: Canadian 50 cent and dollar coins were minted in .800 fine silver up until 1967, after which they were made entirely of a copper-nickel composition. No discussion of Canadian silver coins is complete without a mention of Newfoundland. This Canadian province on the northeastern Atlantic coast was, up until 1949, a British dominion separate from Canada. As an independent member of the Commonwealth, Newfoundland had her own currency, the Newfoundland dollar, and issued silver coins in 5, 10, 20, 25, and 50 cent denominations at various dates ranging from 1865 to 1947. Excepting the 1946-47 10 cent piece, which was made from 80% silver, all of Newfoundland’s silver coins are composed of .925 fine sterling silver. 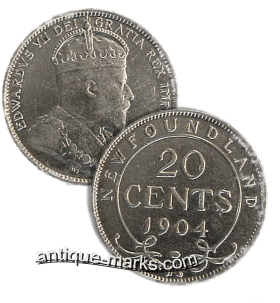 Newfoundland silver coins are a bit harder to find than the very common Canadian series of silver coins, but they are well worth seeking out for their historical value and, for the silver collector, the high purity of the silver.